700 million people use the Facebook News Feed every day but many don’t understand how it decides what appears, so Facebook announced today it will start publishing blog updates on how the feed algorithm is changing similar to how Google does. Facebook’s first post will be about “Story Bumping”, which pushes stories you haven’t seen above ones you have. The News Feed team’s Lars Backstrom says that “News feed is one of only places where Facebook is doing things on the scale of complexity of what Google is doing or Bing is doing in search.” But in some ways its a harder problem because relevance is subjective. Google can show a bunch of people a set of ranked search results and ask if they’re accurate, but the only person who can tell if your feed is relevant is you. In its early days, the News Feed “algorithm” was really just VP of Product Chris Cox and Director of Engineering Boz “twiddling knobs” says Cox. They’d take a ton of anecdotal feedback because Facebook hadn’t built out a better A/B testing system or way to measure impact. Cox says “You didn’t need to be super sophisticated. There wasn’t that much content” because people didn’t share as much or have as many friends. When the News Feed team succeeds, you see things you care about, have a good time on Facebook, and use it more. When it doesn’t, Facebook seems like a boring waste of time. This team makes or breaks Facebook’s engagement level. Before recently, the News Feed would rate all the stories published since you last logged on and show you the best ones. But if one wasn’t quite interesting enough to be right at the top, you might never see it. Then if you came back a few hours later, additional stories would have been piled on top and it was unlikely that you’d ever see it. With Story Bumping, Facebook doesn’t just look at what stories have been published since you last looked at the feed, but at all the recent stories you hadn’t seen — not just “new” but “new to you”. This way you see more relevant stories, even if they’re a little bit older. Facebook has rolled Story Bumping out on the web and is starting to push it to mobile. Initial tests showed the Story Bumping led to 5% more likes, comments, and shares on stories from friends, an 8% boost in interactions for stories from Pages and public figures, and an increase from 57% of potentially visible stories read to 70%. People are reading a larger fraction of their stories thanks to this algorithm change. Facebook’s Lars Backstrom also announced two more News Feed changes. “Last Actor” looks at the 50 people you most recently interacted on Facebook such as viewing someone’s profile or photos, and liking their feed stories. Facebook then shows you more of them in your feed in the short-term. Say you browse through 100 photos of a girl you have a crush on, you’ll see more of her in your feed later that day. Note that this doesn’t mean anyone knows about your private Facebook browsing habits. This feature only affects what you see. The Last Actor algorithm change has been rolled out and is now impacting the web and mobile News Feed. 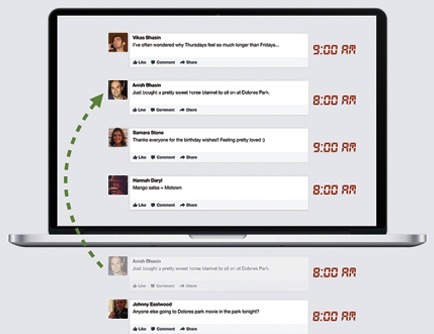 “Chronological By Actor” is Facebook’s attempt to make real-time content more comprehensible. Say a friend is posting rapid updates about a football game. Showing them in ranked order regardless of their chronological order would be confusing, as you might see the game’s final score first, then a photo from half-time, then a touchdown in the third quarter, and then your friend’s excitement about the game starting. So Facebook will soon start to show these rapid real-time updates in chronological order so you see the most recent update first and the oldest one last. As I wrote last week, Facebook could help people to refine their own feeds if they improved education about how News Feed works and the tools available to filter, hide, and promote certain stories. Today’s “Whiteboard Session” has given possibly the deepest look into how the feed works yet. It hasn’t discussed much about the tools users can employ to customize their feed, but hopefully we’ll hear more about that in future.